It’s that time of the year when all we can think about are the holidays and holiday shopping. Running to stores for sales and bargains, checking the web every 5 minutes for great deals, but not leaving enough time for ourselves to prepare a healthy, nutritious and delicious meal. Well, for the amount of time you may spend either ordering a take-out or driving through some building that claims they sell “food” you can be enjoying this beautiful meal! That’s right, it is that easy and quick. 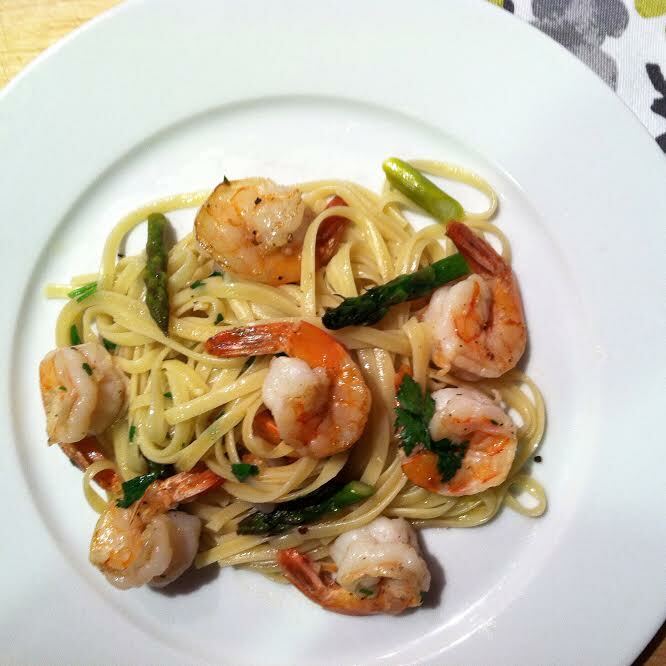 While the pasta water is getting ready and then while the pasta is cooking, you are preparing the asparagus and shrimp. Then when the pasta is ready, just add it to the shrimp and you have yourself a gourmet, delicious meal! Now, how easy is that? So for all of you bargain shoppers, this leaves you more time to shop! Enjoy! Place a pot of salted water to boil. Once it comes to a boil, add the pasta and cook for about 7 minutes. In the meantime, prepare your other ingredients and set aside. In a medium skillet, melt the butter into the olive oil and add the asparagus. Cook for about 1 minute. Season the shrimp with salt and pepper. Add the shrimp and cook for about 2-3 minutes. Turn the shrimp over and add the garlic. Cook for about 2 minutes. Add the wine and carefully mix thru allowing it to reduce down a bit. Cook for about 2 more minutes and using tongs, add the pasta right from the pot into the shrimp mix. You are doing this so some of the pasta water will be added into the sauce to thicken it a little.